Alright, I held out as long as I could. Now it’s time to load you up with all things pumpkin. 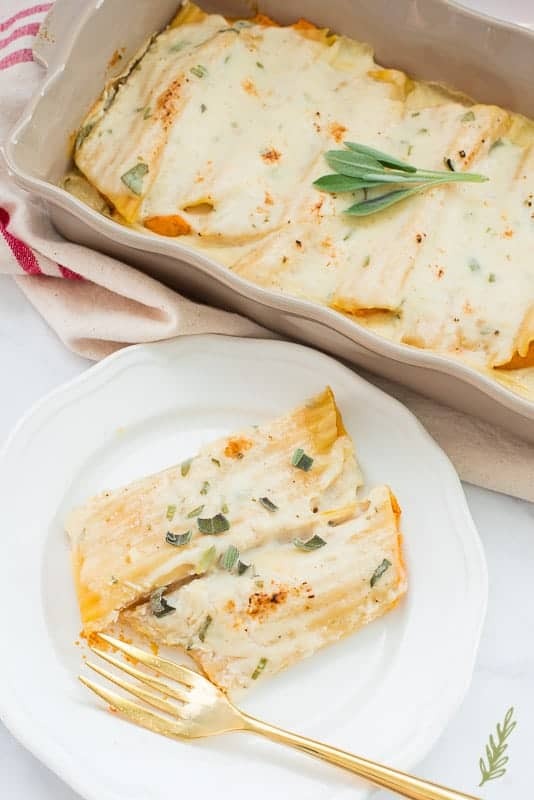 Manicotti stuffed with pumpkin and ricotta, baked in a brown butter-sage béchamel sauce. Long name, sure, but the taste is worth it. This is a vegetarian meal that doesn’t lack for anything. It’s rich, filling, and relatively quick to make. Its ingredients are all inexpensive. This one meal fed my greedy family of four dinner and lunch for the Soldier the next day. Can you say WINNING!?!?! I mean, really. It’s got everything. Now is the perfect time of the year to buy canned pumpkin. Since we’re not in the midst of the holiday baking rush, the prices haven’t been jacked up. Typically, I’d roast and puree a fresh pumpkin, but for some odd reason, pie pumpkins weren’t being sold in my grocery store the day I shopped for it. Grab a can of pumpkin from a reputable brand. I like Libby’s, personally. You’ll also need a small container of whole milk ricotta (you can buy a large container if you want- I have a great recipe to use it coming soon). 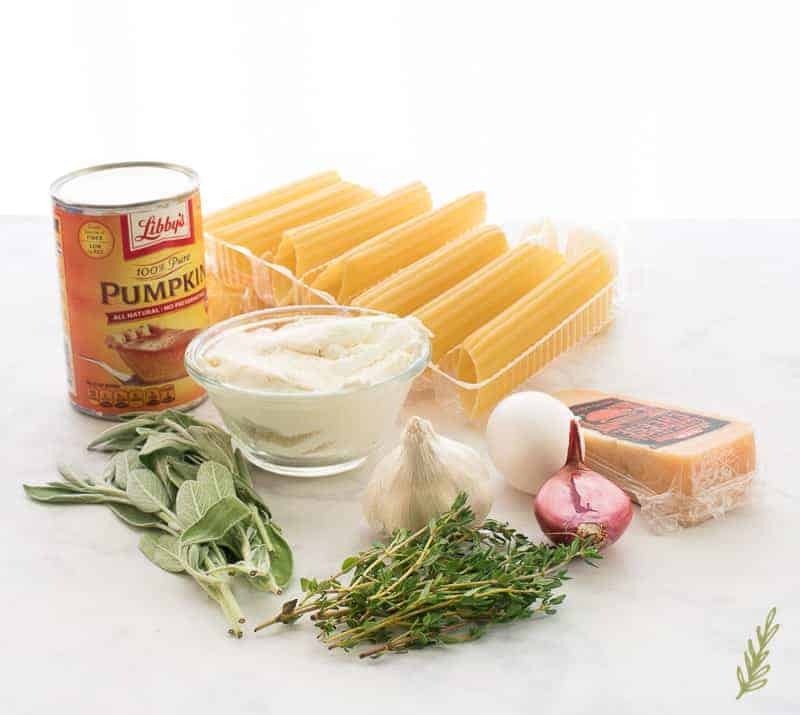 Also pick up manicotti pasta, a shallot, egg, garlic, thyme, sage, milk, butter, and parmesan cheese. Prep all the veg for efficiency. The one thing I’m a stickler about is efficiency in the kitchen. I think the main reason that people “hate” cooking is because it seems like it’s too much work. If you work smartly, you will work quickly. Working quickly means eating quickly. Get the water for your manicotti on to boil. Part of efficiency is multi-tasking. While you’re prepping your veg, get the water for the manicotti on its way to boiling. Invest in a large cutting board. Why does size matter? Well, because the larger your cutting board, the more work you can do on it and the less dishes you will need to use. I have cutting boards for virtually everything I need to cut in the kitchen. 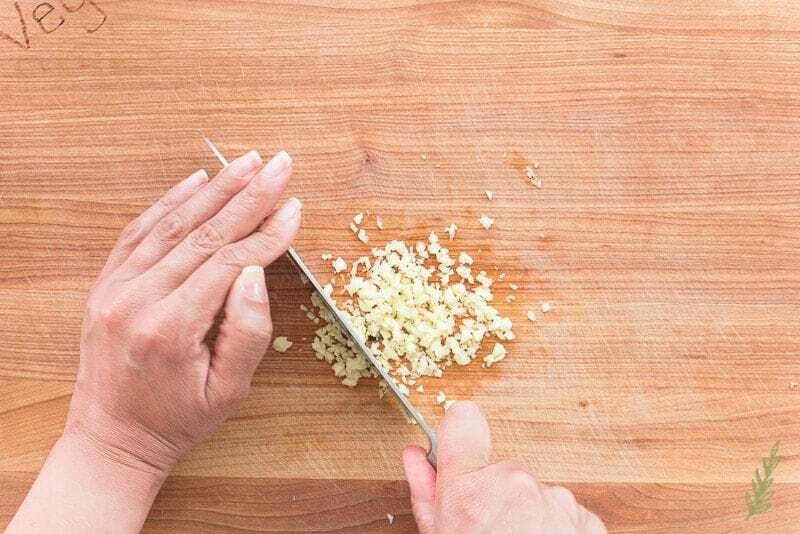 Use a sharp chef’s knife to mince the cloves of garlic. 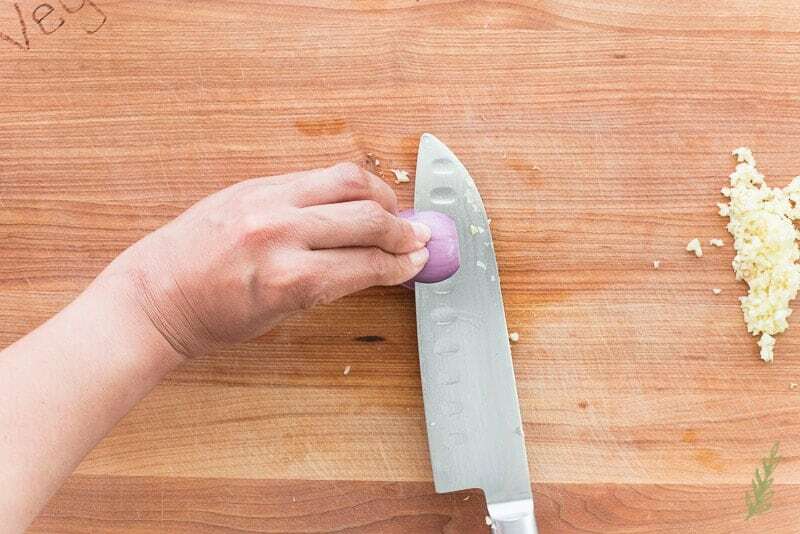 Then use the back of your knife to slide the garlic to a corner of your cutting board. Why the back of the knife? Because it keeps the blade from getting dull. 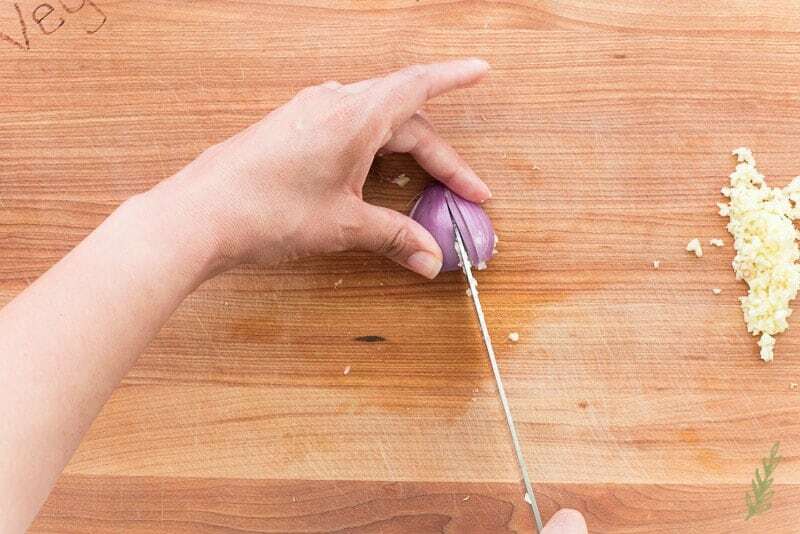 Cut the peeled shallot in half through the root end. The use the flat side as your stable base. 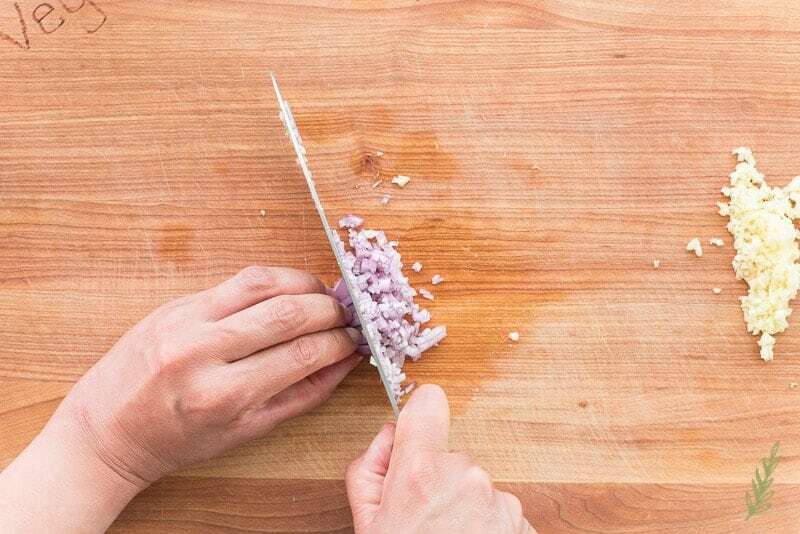 Placing your fingers on top of the shallot half, make thin horizontal slices into the shallot. Turn the shallot and make thin vertical slices through it. 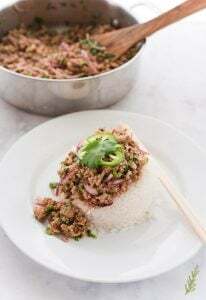 You can now mince the shallot into small pieces. Push this to the side of the board. Try not to mix them in with the garlic because you’ll be using some of the garlic in two separate steps. 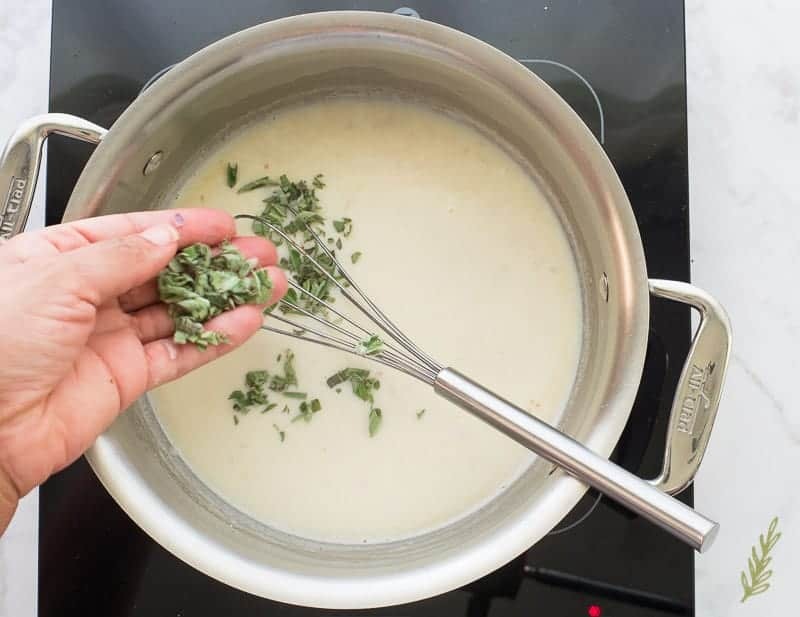 Prep the herbs and cheese. Getting all of this prep work out of the way makes the rest of the dish come together quickly. Pick off the broad leaves of the sage from their stems, then discard the stems. Pile your sage leaves, one on top of the other, until you have a uniform stack. 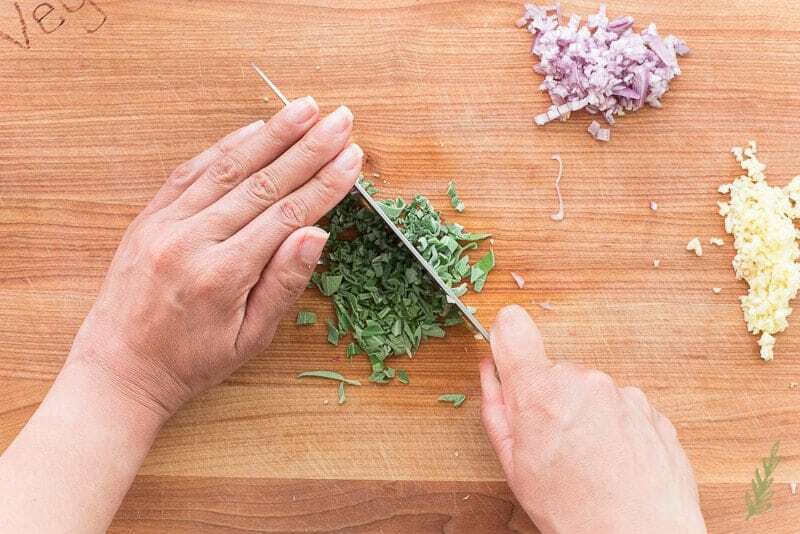 Run your knife through the pile to thinly slice the leaves. Turn your knife ninety degrees and chop the slices. Push this off to the side- see how convenient this big board is?!? Use your thumb and forefinger to pull the tender leaves of thyme off of their stems. No need to chop these since they’re so small and delicate. 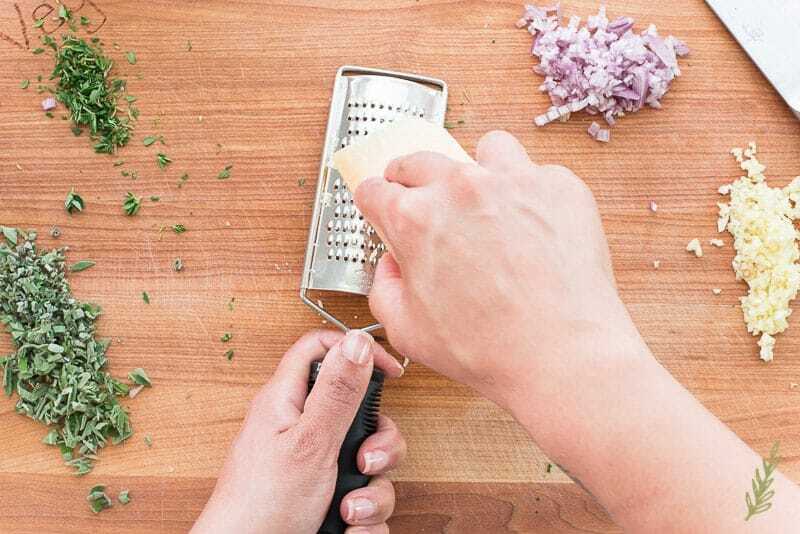 Finally, use a small grater to shred your parmesan cheese. When I say “small grater”, I mean a grater with small holes. This parmesan cheese is just an accent flavor. We don’t want large pieces of it. You can totally grate extra in case you, or your family, want to top the baked manicotti with it later, though. By now, your pasta water should be boiling. Salt it liberally, then dump the manicotti into the water and boil to al dente (according to the package’s instructions). I needed to boil mine for seven minutes. Prepare, and bag, the Pumpkin-Ricotta Filling. 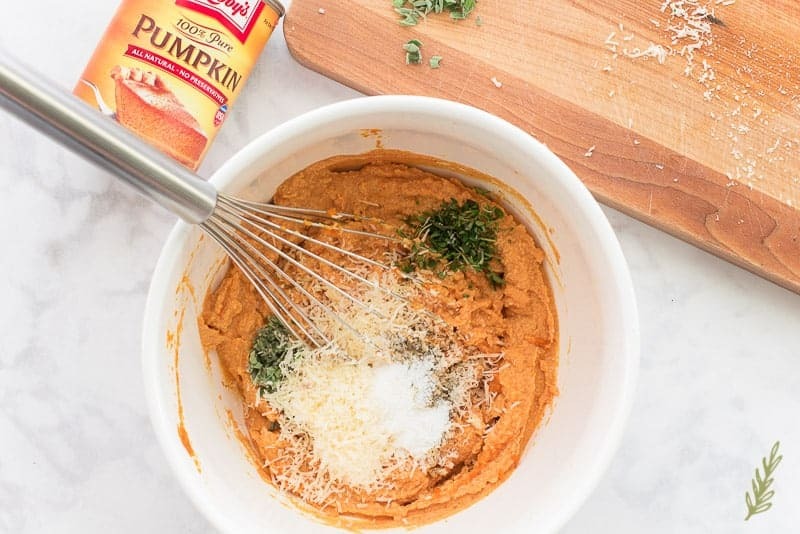 In a medium mixing bowl, whisk together the pumpkin, ricotta, and egg until smooth. Add a portion of the sage, all of the thyme, the parmesan cheese, a portion of the garlic, and the salt and pepper. Whisk the seasonings into the mixture until fully combined. Use a rubber spatula to fill a piping bag (or a sturdy, plastic food storage bag) with the pumpkin filling. Set this to the side while you work on the manicotti. By now your manicotti should be ready to drain. As soon as the manicotti is drained, run very cold water over them to stop the cooking process. This will also prevent the pasta from sticking together while we make the béchamel. A mother sauce, that is. 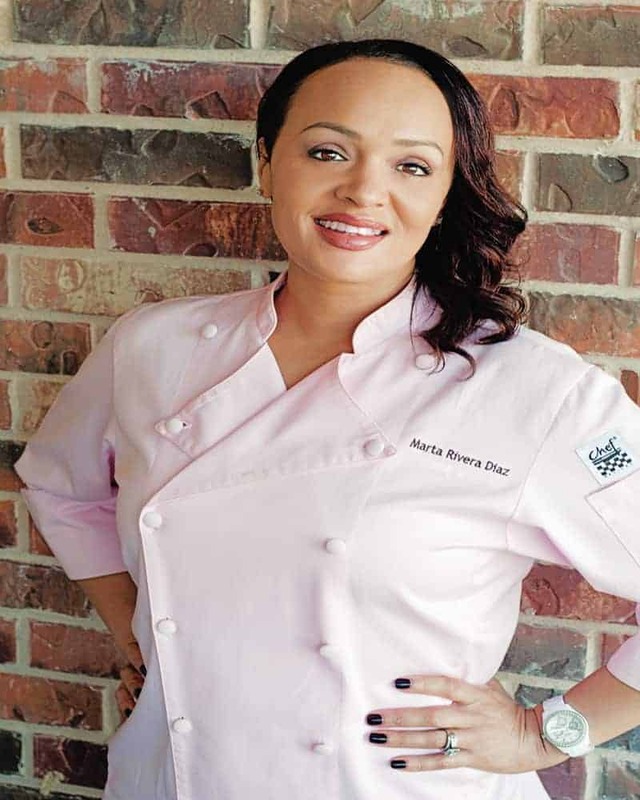 Marie Antoine-Carême (who’s not a chick, in spite of what the name may lead you to believe) dubbed four sauces as the “Mother Sauces”, which Auguste Escoffier adapted to five. Mother sauces are those that are the base for other minor sauces. 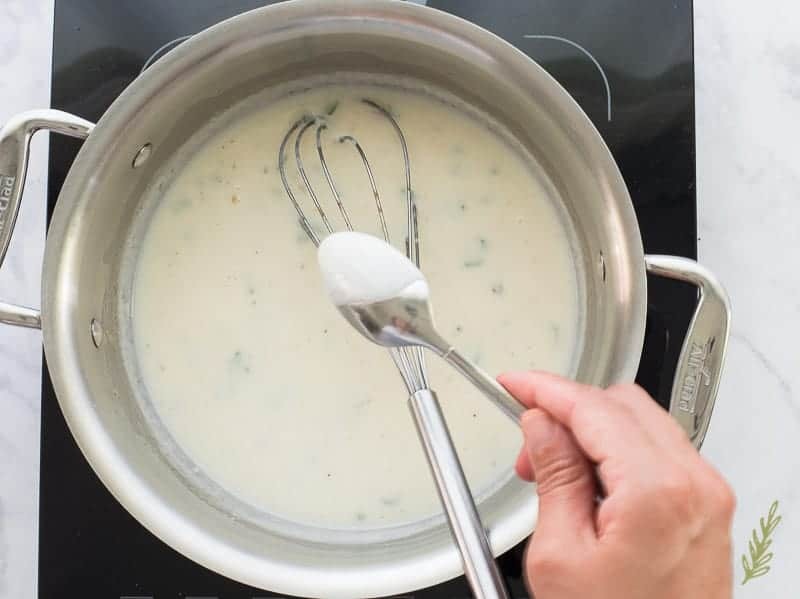 We’ll go into them in depth in another blog post, but for now, we’ll focus on the béchamel, or white sauce. This is the base for cheese sauces, or mornays- think: alfredos, cheddar cheese sauces, mac and cheese bases, etc. This particular sauce is different from a traditional béchamel because I’m beginning it with a brown butter, instead of plain melted butter. 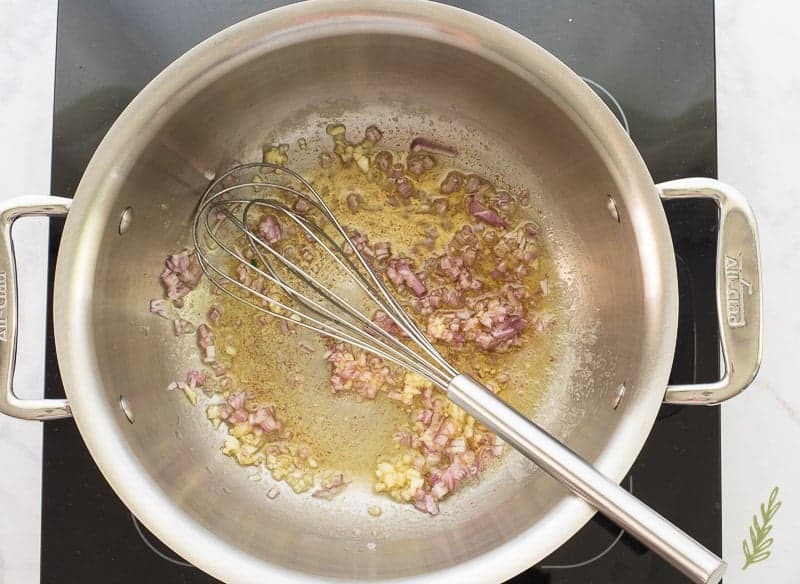 In a sloped-sided pan, or saucier pan, melt the whole, unsalted butter over low heat. Stir frequently to ensure the solids in the butter heat evenly. As the water evaporates, they leave behind the fat solids. These solids will slowly begin to brown (toast), and you’ll begin to see brown flecks in the butter. Now, butter can go from brown to crap in a second, so as soon as you see (and smell) that browning, pull the pan off the stove to stop the process. While the pan is off the heat, add the shallots and the garlic. This will also help drop the temperature in the pan to prevent the butter solids from browning further. Return the pan to the heat, and sauté for three minutes, or until the shallots look glossy. Now add the flour. 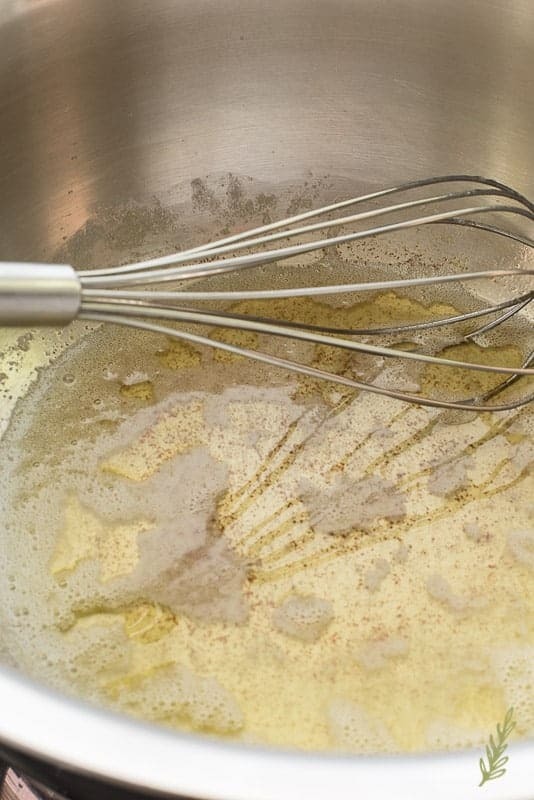 When the flour is added to the butter, it becomes a roux, or thickening agent. This is what will thicken the béchamel sauce. But before that happens, we need to cook the flour so the raw, starchy taste is removed. Cook, stirring the roux, for at least a minute to eliminate that flavor. To begin the final step of the sauce, drizzle in a small amount of the whole milk to create a thick paste. I do this, instead of dumping all the milk in at once, to prevent the sauce from clumping. 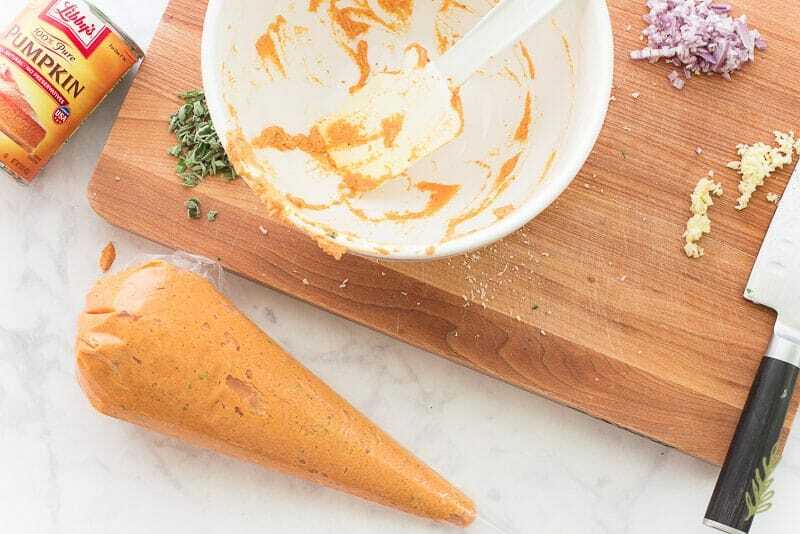 If we were to add all of the liquid at once, portions of the roux would remain in large chunks, instead of developing into a smooth sauce. Slowly pour the rest of the milk into the sauce and whisk constantly, until the sauce is smooth. Add the remaining sage and a small pinch of ground nutmeg to the sauce, then cook until the sauce thickens. Make sure to stir often to prevent the sauce on the bottom from sticking and scorching. The sauce is properly thickened when it coats the back of a spoon, like so. Once the béchamel is done, remove it from the heat and get ready to assemble the manicotti. Spoon half of the béchamel sauce onto the bottom of a large, oven-safe casserole dish. Cut one inch off the tip of your piping bag, and pipe the pumpkin-ricotta mixture into the cooked manicotti shells. You typically need to fill half of the shell before turning it over and filling the other half. Whichever way you go about filling the shells is cool with me, though. Pour the remaining béchamel sauce over the top of the stuffed manicotti. Then, cover the dish with aluminum foil and bake for twenty minutes. After twenty minutes, carefully remove the foil covering and bake for an additional ten minutes to get some color on the surface of the sauce. Remove the baked manicotti from the oven and allow it to cool for at least ten minutes. Ask me how I know that eating this right away will burn the crap out of your mouth. Again, we’re greedy. While you’re waiting for it to cool down, make a quick green salad to serve alongside of it. Once the manicotti has cooled, top it with additional chopped sage or more shredded parmesan cheese. Serve and enjoy. Leftovers can be stored for up to three days in the fridge. Just reheat them in the oven, or microwave, until warmed through. Okay, we’ve popped the pumpkin cherry for the season. Enjoy this dish, and look for more in the coming weeks. In the meantime, pin this recipe and make it for dinner soon! The meatless meal is ready fast! Fill a large pot with water and bring the water to a boil for the pasta. Once the water begins to boil, salt it liberally and add the manicotti. Cook the pasta to al dente (according to the package's instructions)- about seven minutes. 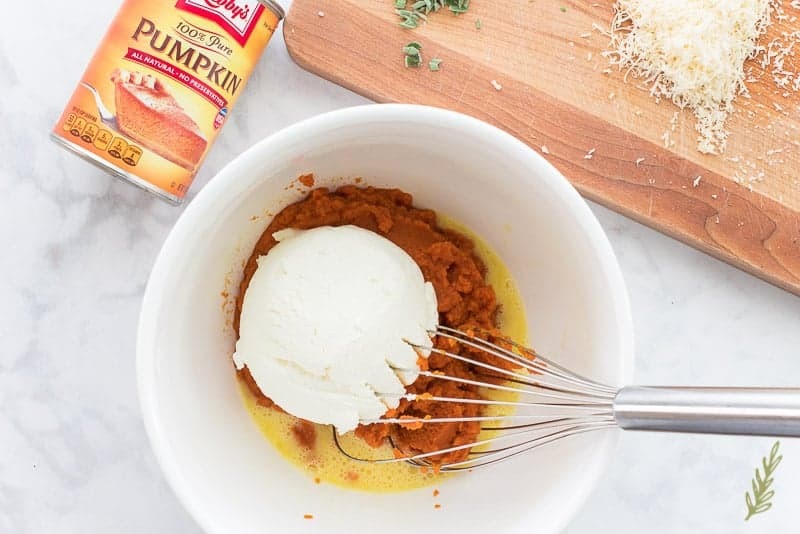 While the pasta is boiling, in a mixing bowl, whisk together the pumpkin, ricotta, and egg until smooth. Add 1 tsp of the sage, all of the thyme, the parmesan cheese, a 1/2 tsp of the garlic, 1/2 tsp of salt and 1/4 tsp the black pepper. Whisk the seasonings into the mixture until fully combined. Use a rubber spatula to fill a piping bag (or a sturdy, plastic food storage bag) with the pumpkin filling. Set aside. Once the manicotti has finished boiling, drain it in a colander. Immediately run very cold water over the pasta to stop the cooking process. Set this aside. In a sauce pan, slowly melt the butter over low heat. Stir frequently to ensure the solids in the butter cook evenly. 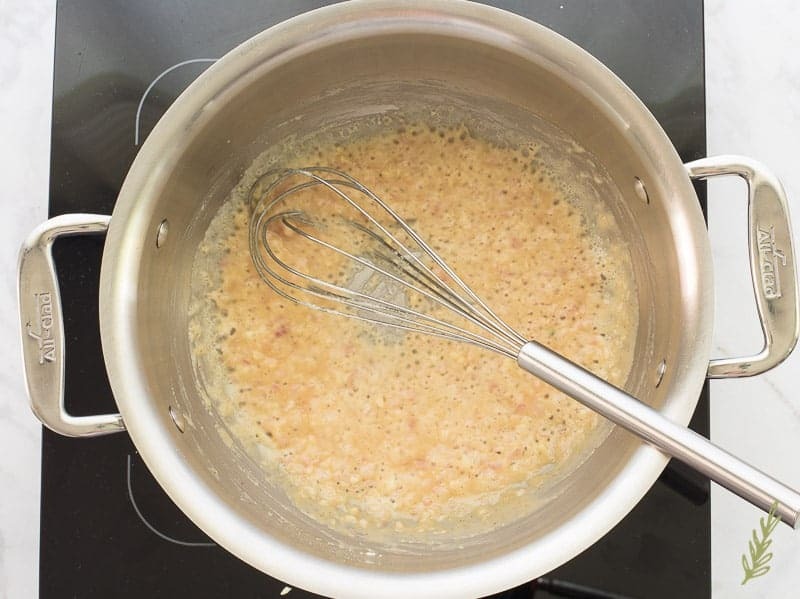 Once you begin to see brown flecks in the butter, remove the pan from the stove to stop the browning process. Add the shallots and the remaining garlic, and return the pan to medium-high heat. Sauté for 3 minutes, or until the shallots look glossy. Add the flour to pan to create a roux. Cook, stirring constantly, for 1 minute. 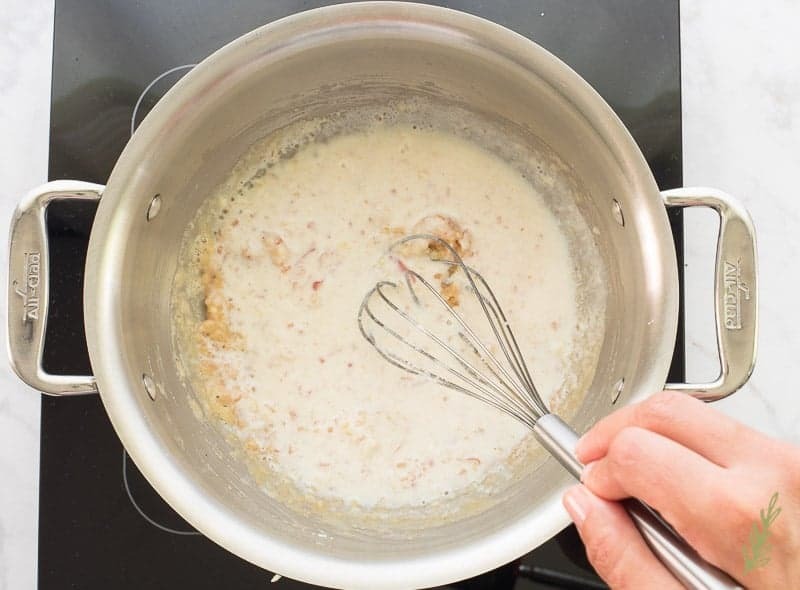 Add a small amount of the milk to the roux to create a thick paste, stirring constantly. Slowly stir the rest of the milk into the sauce. Stir until smooth. Add the remaining sage, salt, and pepper, and the nutmeg to the sauce, and cook until thickened. Be sure to stir often to prevent the sauce from sticking to the bottom of the pan and scorching. The sauce is properly thickened when it coats the back of a spoon. Once the sauce has thickened, remove the pot from the stove. Spoon half of the béchamel sauce onto the bottom of a large, oven-safe casserole dish. 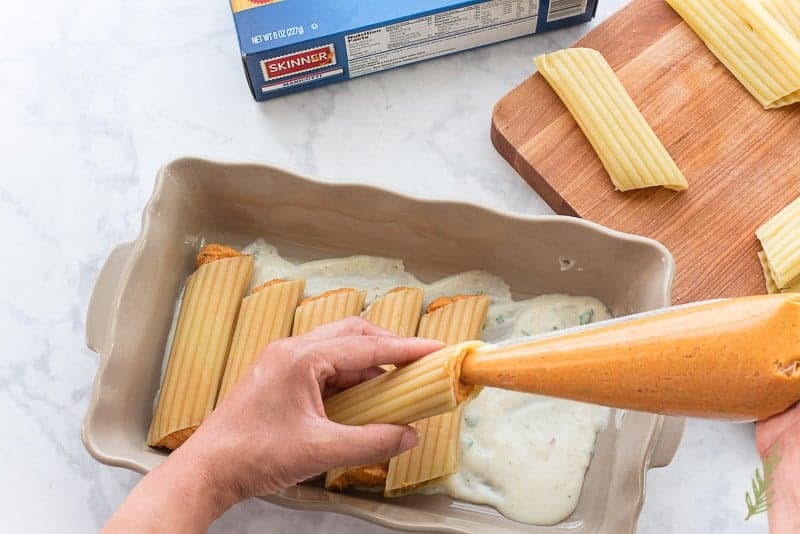 Pipe the pumpkin-ricotta mixture into the cooked manicotti shells and arrange the stuffed shells in the pan in a single layer. 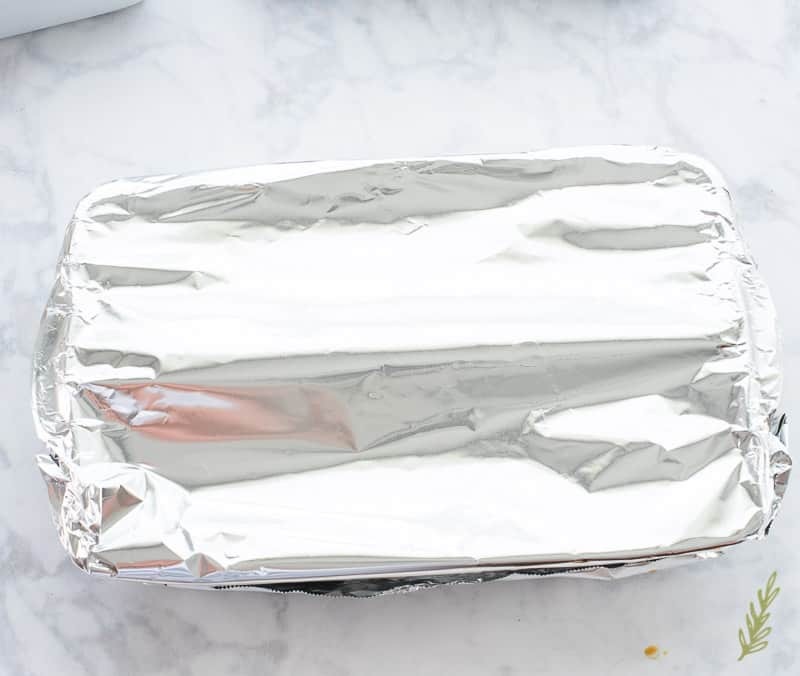 After 20 minutes, carefully remove the foil covering, and bake for 10 more minutes. 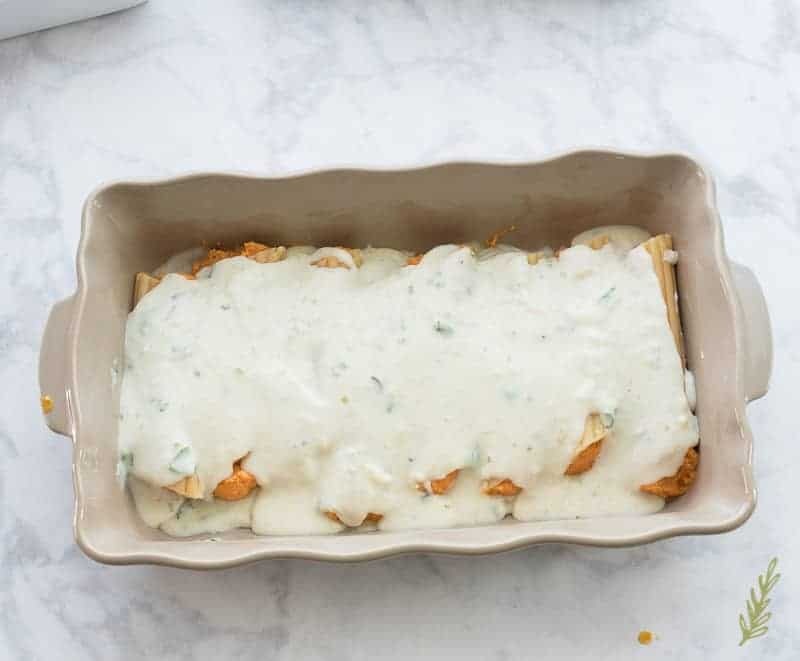 Remove the baked manicotti from the oven and allow them to cool for at least 10 minutes. 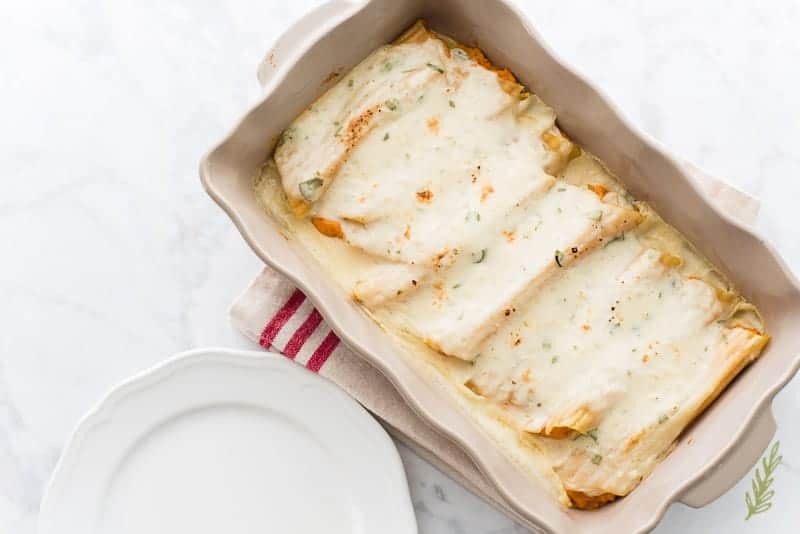 Top the baked manicotti with more chopped sage or shredded parmesan cheese. Want to try something other than Pumpkin-Stuffed Manicotti? 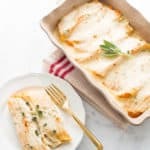 I love pumpkin ricotta lasagna so I’m positive these manicotti would be a winner for me. Such a fantastic comforting meal for fall and I love how much better dishes like this are the following day! Oh, for sure, Jenni! You’ll love the added béchamel sauce. What a lovely dish and this looks perfect for the season! I LOVE meatless dishes, too! Thank you, Patricia! I hope you can try it out sometime! As a vegetarian, I’m always on the lookout for flavorful recipes. This looks absolutely amazing! Pasta is my favorite. The pumpkin + sage combo looks delicious. This is a great one for you, Christa. My meat-loving husband didn’t complain once! Oh my goodness, this sounds incredible. Give me anything pumpkin and I’m sold. I will have to make this soon. I need to start making more meatless items too. This sounds perfect. I am pinning this for later. Thank you, Courtney! Let me know what you think of it! Literally as I read the title of this post my eyes widened…..it got better with every word! Sounds so delish! LOL!! It’s a mouthful isn’t it? But it’s SOO good! This looks amazing!! You can be sure it will be making in my kitchen this weekend. I hope you enjoy it as much as we did, Renae! I may just melt my husband with this treat. 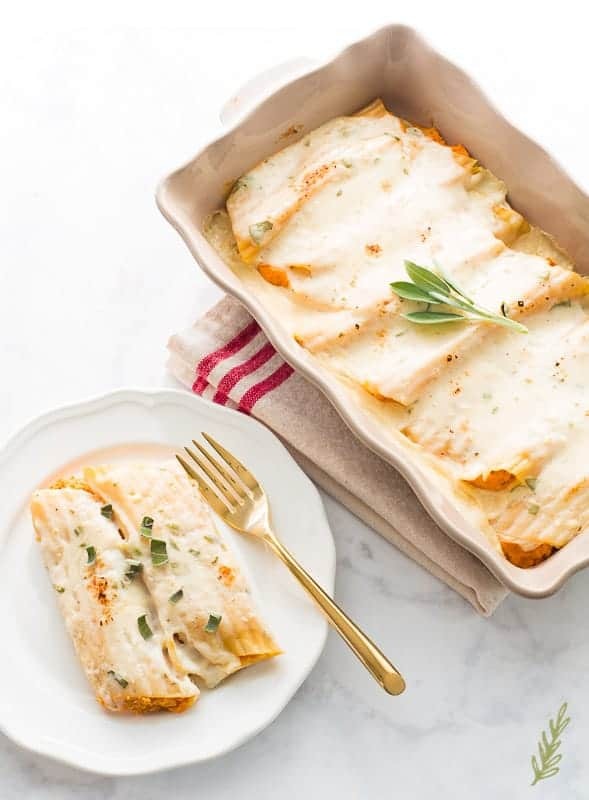 We are fans of anything pumpkin, but we’ve never had manicotti pumpkin ricotta. Yum! Get it, girl!! I know you two will love it, Tami! I’ve never been big into pumpkin but this year I’ve already been eating pumpkin dishes and this one sounds amazing! I’ll definitely have to give this one a shot. Thanks for the awesome recipe! Surprisingly enough, I hate pumpkin. With few exceptions, I’ll avoid it. This was one of those exceptions. Yay! I love pumpkin! Anything pumpkin. Excited to try this out! I hope you love it, Cassie! What a great combination of flavors! The thyme and pumpkin sound like they blend wonderfully. 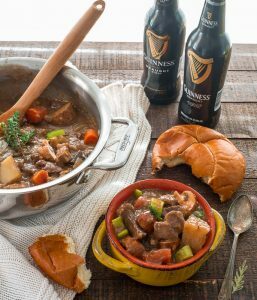 I’ll have to give this a try as I am in a bit of a dinnertime rut and this is perfect for fall. This is great for switching things up, Marysa! Yum!! Marta, this looks delicious! 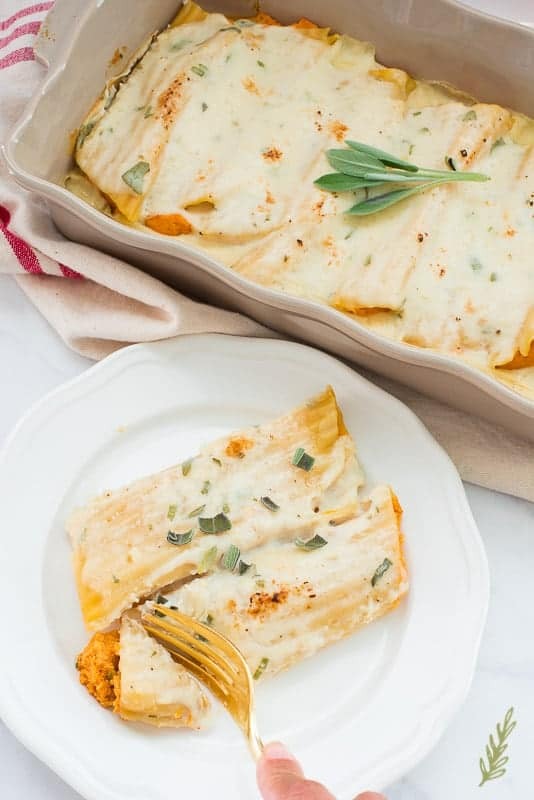 I haven’t tried making manicotti and this just looks super delicious! It’s so easy and it’s a great change of pace, Peachy! Tried this tonight and it absolutely did not disappoint! The flavors were complex and lovely but the recipe itself was simple. I’ve made a lot of bechemel sauces and this one, following your directions, came out the best yet. Great instruction and recipe! I’m so glad to hear that, Marie! I know you’re a foodie so that means a lot to me. When I saw the cover photo, I knew I had to click it and save the recipe! I don’t like cooking and I get overwhelmed with recipes, but I love reading yours. It’s easy to follow! Well, that brings a huge smile to my face! 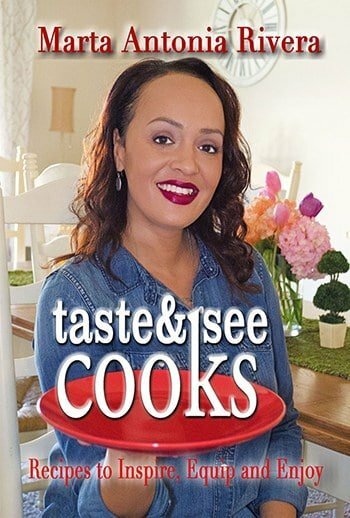 My mission is to make people love cooking as much as I do!